Bzzzzz... June Bugs Web Sale! Once again, it's been a while since I've been in touch, and that goes to show that I have been a busy bee! Right now, my sunroom studio is filled with wire wings and delicately curled antenna, all awaiting to be attached to their whimsical bug companions. 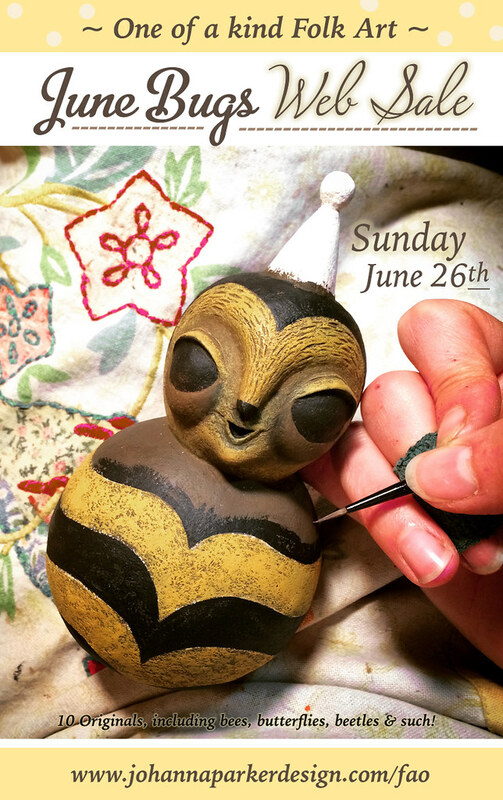 I have sculpted a collection of 10 one of a kind folk art bugs, including bees, butterflies, beetles and more for my June Bugs Web Sale! With the garden in bloom and the pollinators bouncing from one flower to the next, I was inspired to take a moment (or, in this case, a few months) to celebrate and create my interpretation of these garden characters. It's been a fun diversion from my classic fall & winter holiday palette, and I am looking forward to sharing them with you on my Folk Art Originals page this month! Please Join my Mailing List for the Start time and more details. Happy Summer & Enjoy the Garden!